Follow the Hooves Eid Game – Hello Holy Days! In Muslim countries, it officially starts to feel like Eid al Adha once animals are brought home for Eid. Children particularly love this part of Eid al Adha because they have so much fun playing with the goat/ sheep/ cow/ or camel. You can recreate the same excitement for North American kids with a little help from chocolate animals. Play my “follow the hooves game” to let kids know that the animals are home to kick off the holiday! This is a great game to play a few days before Eid al Adha to build up anticipation for the holiday or on Eid day itself! 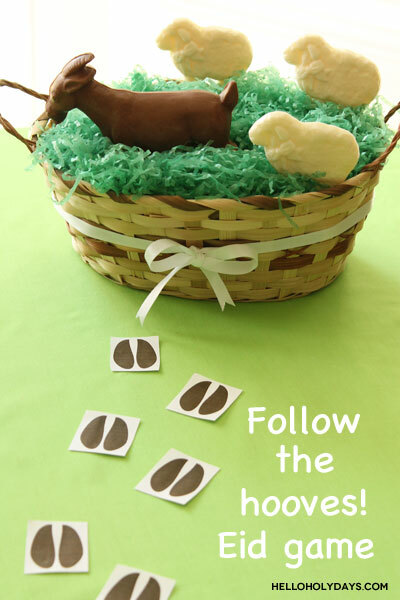 Print clipart and loosely cut around the hooves with scissors; strategically place them around the home leading up to the basket with chocolate Eid animals. When placing the hooves, remember that the pointed ends face front. For added fun, place the first set of hooves near your child’s bed while they are asleep. When they wake up in the morning, have them follow the hooves next to their bed all the way to their chocolate surprise! If you’d prefer for your child to avoid eating sweets, have the hooves lead up to a basket with plush or plastic Eid animals to play with instead.